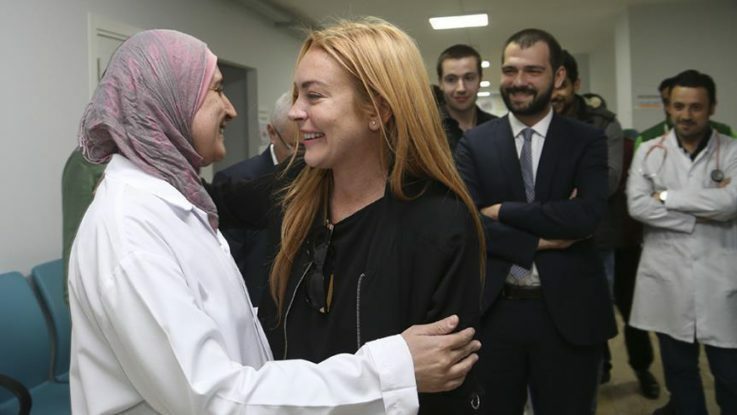 American actress Lindsay Lohan reportedly burst in tears when visiting Syrian refugees at a hospital in Istanbul on Monday. Accompanied by Turkey’s Deputy Minister of Youth and Sports Abdurrahim Boynukalin, Lohan greeted a Syrian man from Aleppo with both of his legs paralyzed. “Lohan listened to the man’s life story and began to sob,” Boynukalin told Anadolu Agency, adding that Hollywood’s awareness of the Syrian crisis is crucial. Lohan is one of many other celebrities who have shown interest in helping Syrian refugees, including Angelina Jolie, who is a Good Will Ambassador for the UN, and Salma Hayek, who visited refugees in Lebanon last year to raise funds. Turkey is hosting the largest number of Syrian refugees in the world – 2.7 million – and has so far spent around $10 billion for the refugees in Turkey. Syria has been locked in a vicious civil war since 2011, when the Assad regime cracked down on pro-democracy protests – which had erupted as part of the Arab Spring uprisings – with unexpected ferocity. The Syrian Center for Policy Research, a Beirut-based NGO, has put the death toll from the six-year-old conflict at more than 470,000.